This is the second CD to be produced by the EFDSS since its apparent reincarnation as a living entity around eighteen months ago. I am particularly pleased to see it, as I was less than optimistic about whether another would appear after A Century of Song was published last Spring - and I'm always glad to be proved wrong by a positive outcome. What this present record does is to put what I presume to be William Kimber's full recorded repertoire of morris tunes on one chunk of medium, and in the best sound-quality we could reasonably hope for. Never having been a 'Kimber Nut', I've had to do a little research, but it seems that most of what he recorded appears here. But it is rather surprising that the following tunes: The Ribbon Dance, The Fool's Dance, The Four Hand Reel, Step and Fetch Her, Pop Goes the Weasel, The Quaker's Wife, Bonnets So Blue, Hilly-Go Filly-Go, Schottische - all of which appeared on the EFDSS's own 1963 LP - should not have found a place. Perhaps the fact that the record is 'sponsored by the Morris Ring' ensures that it is the morris tunes which get a full airing, while some of the country dance tunes are omitted. The whole CD is nicely presented in a card slipcase together with a 64 page booklet with text of a reasonable size, and another of Jon Dudley's rather classy graphics schemes (I hope he charged a fee for this one!) The cover is perhaps no quite so arresting as on Century of Song, but it's a better text-job, and thus more functional. What is considerably less functional is the fact that there are two booklets with the record. I was initially concerned that I had not seen any clear indication of when each recording was made, and as these dates could range from 1935 to 1959, it would be good to have a clear idea of where one is, chronologically, when listening to a track. This complaint was answered when I discovered the second booklet - which lives inside the CD jewel case and which I had presumed was merely an inlay card, because of the presence of the first 'big' booklet. This leads me to suppose that a major design miscalculation was made at some advanced point in the process when it was too late to change it - or that the whole design had not been properly thought through. I think the 'big' booklet was originally intended to go inside the jewel case (it's the right dimensions), but ended up too thick to do so. Rather than use one of the larger Topic VotP style cases, they decided to add the slipcase - but then needed to add a lump of thick cardboard inside it to make up the size, the booklet being considerably smaller than the external dimensions of the jewel case. So we end up with several items - a slip case, a jewel case, a CD, a big booklet, a small booklet and a lump of cardboard - any one of which can get mislaid. More to the point, the two booklets have identical covers, and so are easy to confuse, and you have to search through both in order to find the information you want. No marks for whoever came up with this as a design concept! One of the first things to strike me when I encountered the advance publicity for this record was the title - Absolutely Classic. I couldn't see the relevance and, moreover, snatches of Tom Stoppard's On the Razzle kept returning to me. Now that the finished product is in my hand, I discover that the phrase was used by one Alfred H Littleton to describe Kimber's dance style. I rather have my doubts as to what Littleton - the Master of the Musicians' Company - might have known of classic Oxfordshire morris style in 1911, but let's not quibble. But as this CD is of his music, I am bound to wonder if it is still an appropriate title? What little I do know of south Cotswold morris music of the period leads me to think that Kimber was quite unusual, stylistically, and that 'classic' is certainly not the adjective I would have chosen as the most appropriate. The booklet notes actually admit that 'the anglo-concertina and the vigorous, rhythmic style of playing it favoured by Kimber, was not so common until some years after his death' in 1961. Another oddity is the decision to include a track each by John Graham (Kimber's successor musician at Headington) and John Kirkpatrick. True, both play 'Kimber' tunes - but so does half the revival ... It may be reasonable to include John Graham from an 'continuing tradition' perspective - though his playing, on a big piano accordion, is stylistically very different from Kimber's. But the logic for including a track from John Kirkpatrick eludes me completely. Certainly, he's a fine player, he has a life-long dedication to the Morris - and he can do a good approximation of Kimber's style, as heard here with Laudnum Bunches. But what more do either of these tracks tell us about William Kimber and his music? If there were five minutes of spare space on the CD, I would have thought that some examples of Kimber's contemporaries - musicians from other Cotswold sides - might have been more illuminating. Or, perhaps, the missing country dance tunes mentioned above might have been included instead? Maybe, as so often with the EFDSS, there is some sort of hidden agenda of which I am entirely ignorant? The two booklets are written by Derek Schofield, who also compiled the CD. This must have been a tremendous task for one individual in a limited amount of time, and I salute him for a first rate result. If elements of this review are critical, I hope they are taken in the constructive spirit in which they are intended, and that it will be borne in mind that I am writing for an informed and relatively specialist audience. If this were a 250-word fRoots review, it would be full of unstinting praise! This is not a complaint to lay at the door of Derek Schofield - he was only working with the information available to him - but at the grand portals of Cecil Sharp House itself. How is it that the EFDSS, which, to quote its new letterhead, still aims 'to encourage ... dance traditions within England', knows so little about this traditional dancer of whom they made so much for 62 years? They know about every Society meeting he ever attended and what he danced or played. Every Ring meeting or Summer School appearance is documented, and most particularly, every Important Personage who ever deigned to notice him is faithfully recorded. But of his place in the culture which created him we hear very little. In fact, one is bound to ask - faced with the information given here - whether there actually was much of a morris dancing tradition at Headington during Bill's lifetime. We learn that he was taught to dance and play the concertina by his father, that he and his brother Tom attended a concertina club which met in one of the local pubs, that he was a member of Headington Mummers, and that he played the bass drum in the local drum and fife band for 65 years. All this is revealed in the first couple of pages of the booklet - yet is never mentioned again, except for a few references to the Mummers in relation to EFDSS activities. Although hard evidence as to the age of the Headington morris tradition is not available, family tradition has it that at least five generations of Kimbers danced - back to a William, born 1732. Although the young Bill often tagged along with his father on morris outings, he apparently only started dancing with the side in 1887 - the year in which public dancing lapsed, though they did dance once informally the following year. Ten years later, the tradition was revived by a local antiquarian, Percy Manning, with Bill Kimber joining as a dancer in 1899. It was this one-year-old side which Sharp saw on Boxing Day - an unlikely circumstance, since the summer was their normal time for dancing and they had only gone out through necessity following a spell of bad weather which had left most of the men without any income for some three weeks. It would appear that this side survived until the First World War, and was revived again in 1920, lapsing again in 1936. A final revival took place in 1948, although dancing at Headington Quarry itself did not resume until 1951. 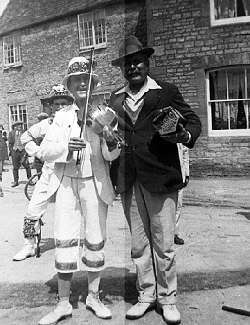 Since virtually all the references to the side concern appearances at Society or Ring events, we have no real way of knowing (from the notes) the extent to which these various incarnations of the Headington Morris functioned as a traditional side within its home village. Certainly, they did not for some 28 years - or not with Bill Kimber as a member. It does not seem unreasonable to suggest that he was not involved in traditional morris dancing in its traditional setting for at least half his dancing/playing life. And what about the other half - what was he doing then? For most of it, it would appear, he was acting as a paid and unpaid worker and teacher for Cecil Sharp, the Society and the Ring. Exactly who was exploiting whom and to what extent is unexplained and probably unfathomable, and there was also undoubted love and respect on both sides. Very clearly, both benefited enormously from the collaboration in terms of fame and prestige - financial benefits, it would seem, were less evenly shared. Sharp became a very wealthy man on the revenues produced by the publication of his numerous books of songs, dances and tunes, and no small proportion of this wealth must have derived from both the music from, and the subsequent work on his behalf by, Bill Kimber. Yet we hear nothing of any particular financial generosity from either the man or his Society towards their oh-so-willing creature. This is particularised by the story of Percy Grainger's use and adaption of Country Gardens and Shepherds' Hey. Grainger had encountered both tunes in Sharp's Morris Dance Tunes book of 1907, and wrote numerous arrangements of them in subsequent years and even recorded them himself several times. Relations between Sharp and Grainger were not always cordial, but the latter made so much money out of his arrangements that he felt honour-bound to offer Sharp 50% of the royalties for providing him with the tunes in the first place. Sharp refused the offer, which was repeated again in 1924 and this time accepted. But, as Derek Schofield comments: 'It did not seem to occur to either man that perhaps William Kimber could have benefited financially from the tune's success'. 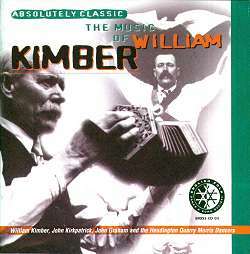 But this CD and its accompanying booklets are produced by, and largely for, the EFDSS and the Morris Ring, and so it is William Kimber's relationship to them which is central to the publication - Bill Kimber the traditional morris man is of secondary importance. It is interesting to compare the treatment of Kimber and, to a lesser extent Jinky Wells of Bampton, by these two organisations with the way they have failed to appreciate the life and work of Francis Shergold at Bampton. Not a man to be overly impressed by such people and generally scornful of the Ring sides he has encountered, Francis has been largely ignored by both. Only after virtually single-handedly maintaining the Bampton tradition through the bad years of the 1950s, building it up into the unique wonder that it is today, and dancing every year for 60 years (45 of those as Squire) did the Society get round to awarding him its Gold Medal at its National Gathering in 1996. Moreover, I was shocked at the Society's singularly patronising expectation that the Dancers would attend the National Gathering and perform, but were not to be paid even their expenses from Oxfordshire, because, as the Society's then Chairman informed them, "it is something of an accolade to be asked". 'What about the music?' I hear you cry. Well, I wonder what there is to say? This is Bill Kimber playing his morris tunes - most readers will have heard most of them before, though not in this sonically cleaned state. He was a pretty consistent player, allowing for the problems attendant upon the aging process, and played all his music - morris and country dance tunes - in the same style. It would be unkind and superficial to say 'When you've heard one, you've heard 'em all', but there is a degree of truth in it. The CD's prime importance is in that it collects most of his recorded music onto one record - the complete track listing can be seen in our Traditional Discography. Most of these recordings have been published before, principally by the EFDSS and Topic, but there are five tracks (Constant Billy, Laudnum Bunches and three conversation extracts) which come from tapes made in 1957 by Christopher Chaundry, which will be new to most listeners. Dave Townsend and Andy Turner contribute five pages to the main booklet, discussing the stylistic characteristics of Kimber's anglo-concertina playing. Much of this is quite interesting (most, if you can read music, I imagine), and there is a paragraph dealing with the suggestions that his style had been in some way influenced by his close and continued contact with the Revival. Needless to say, these suggestions are refuted - but not terribly convincingly, to my mind. It is first stated that he told Ken Loveless "those are the notes you play, and you don't play any others" - as his own father had told him a generation before. Based on this statement, were are expected to believe that he played exactly as his father had done. Yet on p.32 we had been told that both his dancing and playing had developed variations over the 30 years since Sharp first noted them down, and that he admitted the fact - saying (amazingly) "The book [The Morris Book] is IT. If I am playing the tunes different to what they are in the book, then it is I that am wrong". It is also suggested that his harmonies are those which fall most simply to hand on an anglo, and are nothing like those that anyone trained in western art-music would have produced. I've no doubt that this is probably so, but I don't see that this must mean that he wasn't influenced by them in any way. Another argument advanced is that 'The deep conservatism of his repertoire ... makes it unlikely that he would alter his whole approach to playing as a mature musician'. I'm not sure that Pop Goes the Weasel does in fact indicate such a deep conservatism. We are told that he was actually quick to learn new tunes, and did so when Headington added dances from other morris traditions to their repertoire, to enable them to participate more fully in Ring meetings (more evidence of 'deep conservatism'?). It is also interesting, though probably irrelevant, that the EFDSS - often pioneers in the use of sound-recording technology - never had him recorded until 1935. Even more extraordinary is the fact that he was never photographed actually dancing - this famous 1912 picture is posed. The extent to which he was influenced by the revival is obscure, but to deny any influence seems fatuous. We now come to the enhanced part of CD, which is constructed out of .html files - viewable through your favourite browser - and works like a small website. I am much impressed by the EFDSS's bold step in adopting such a forward-looking approach and using such up-to-date technology - but I do wish they'd asked someone with a rather better idea of how to design for it. Almost everything is wrong with the way the concept has been implemented - there are no back-outs from pages, only two returns to main menu, the content is not centred, the background graphic makes the hypertext links difficult to read, the concertina logo is very scrappily rendered, the heading text which looks fine as that is hideous when reduced in size for button labels ... and the entire site, which could, with thought, have been executed from one single home page, is in fact constructed out of almost a dozen separate pages. A for Effort - E for Implementation! Nor, when you finally get to it, is the content all that much to write home about. 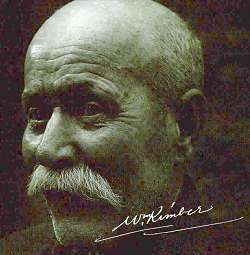 The extremely short video clips are of considerable historical importance, and as such are welcome, but only two have sound and most are indicative more of the inexperience of the film-makers and the shortcomings of the technology than they are of Kimber's (or Headington's) playing or dancing style. The 42 photos all, I think, appear in the booklets - and in considerably better reproduction there. Some are just dreadful on the CD. As an example, let me show you the famous one of Kimber and Jinky Wells at Bampton in 1931: this has the right hand side original and the left I made look rather more respectable in about 20 seconds of work in PaintShop Pro. There is also an 'interactive painting' which you are invited to 'decode'. Basically it's an imagemap and when you click on people in it, some text tells you who they are. The painting is by Anthony Morris, a member of the Headington side, and shows the scene at the momentous occasion of Sharp's first encounter with Kimber on Boxing Day 1899. I do not feel qualified to comment on the quality of the painting, particularly as its reproduction may be no better than that of the photos. All of the information titbits obtained through the 'decoding' process are already known to you through reading the booklets. Lastly, there are two transcriptions of tunes in addition to the one included in the booklet - or so it says, but another slip-up seems to have occurred. The booklet states that Trunckles appears in the booklet and that Double Lead Through, Bacca Pipes and Jockie to the Fair appear in the enhanced part of the CD. Not so! In fact we get Trunckles again and Double Lead Through - but of Bacca Pipes and Jockie to the Fair there is no sign! What's more, the transcriptions are dreadfully reproduced as 2-bit .gif files and are rendered pretty well unreadable in the browser display. All in all, the enhanced part of CD is a bit of a disappointment, containing little of real worth which has not already been seen in the booklets. This is a great shame, because it's a good idea and a bold move for so small a company with a traditionally conservative outlook. I hope it doesn't result in their abandoning such an approach for future projects - but I really do think that they ought to get better advice before making a second attempt. Whilst on the subject of new technology - I was delighted to see that the EFDSS now has a website. I found this out not because they e-mailed MT to tell me so, but because the Press Release accompanying the CD is printed on their smart new letterhead and, among all the other details lined up down the side, is the website address: WWW: EFDSS.ORG.COM - which is, of course, wrong! At least Derek got it right on the CD, so I entered www.efdss.org in my browser and had a look .......... PLEASE DO NO DO THIS if you have a delicate disposition, any sort of design sense, or remotely refined feelings about the use of colour. This is not the place to discuss the EFDSS's website in any detail, but be warned - it is truly, deeply horrid! Absolutely Classic, which despite all my reservations is a very worthwhile purchase, is available from the EFDSS at �14.99 plus �1 p&p.